The Rebel Sweetheart. : Get a Multiple Entry Visa to Korea with a BDO/BPI Credit Card! Get a Multiple Entry Visa to Korea with a BDO/BPI Credit Card! Get a multiple entry visa to Korea! We were lucky to have been granted a multiple entry visa on our first application, thanks to my BDO-issued American Express credit card. 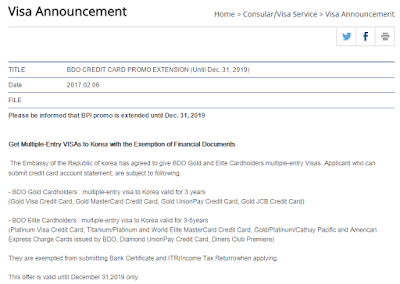 Back then, BDO had a promo wherein its cardholders (BDO Gold, Platinum, and American Express) can enjoy a multiple entry visa privilege to Korea for up to five years and be exempted from submitting financial documents such as Income Tax Return (ITR) and Bank Certificate. The first step to our Seoul Searching - applying for a Korean visa! More info on how to get a Multiple Entry Visa to Korea after the jump! Fast forward to 2017, BDO has just announced that this promo is extended until December 31, 2019. The announcement is posted on both the BDO website and the official webpage of the Embassy of Korea in the Philippines. 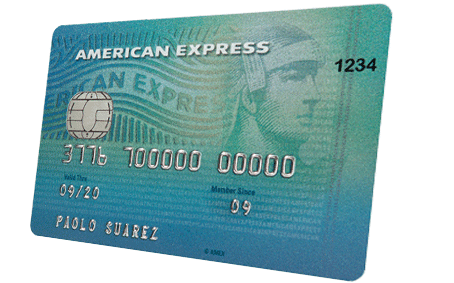 The American Express credit card. Here is the announcement, as posted by the Korean embassy. "Get Multiple Entry Visas to Korea with the Exemption of Financial Documents. 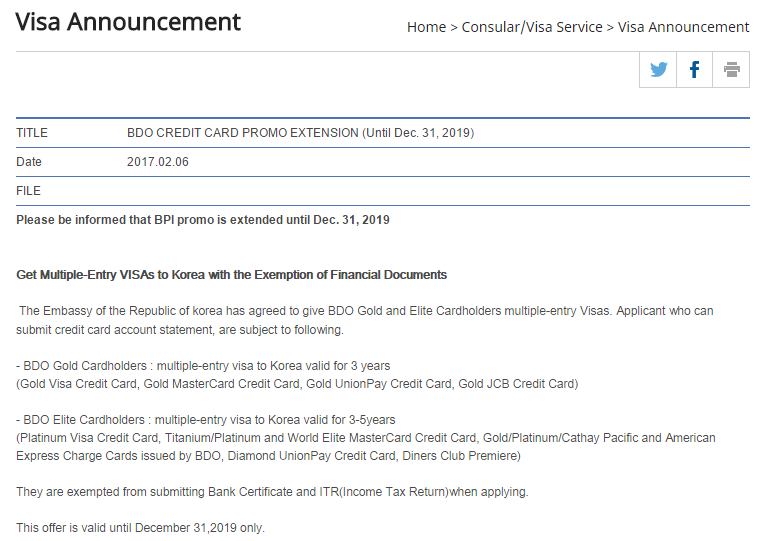 The Embassy of the Republic of Korea has agreed to give BDO Gold and and Elite Cardholders multiple-entry visas. Applicants who can submit credit card account statement are subject to the following. They are exempted from submitting Bank Certificate and ITR (Income Tax Return) when applying. This offer is valid until December 31,2019 only. Employment Certificate/ Business Permit is still required." 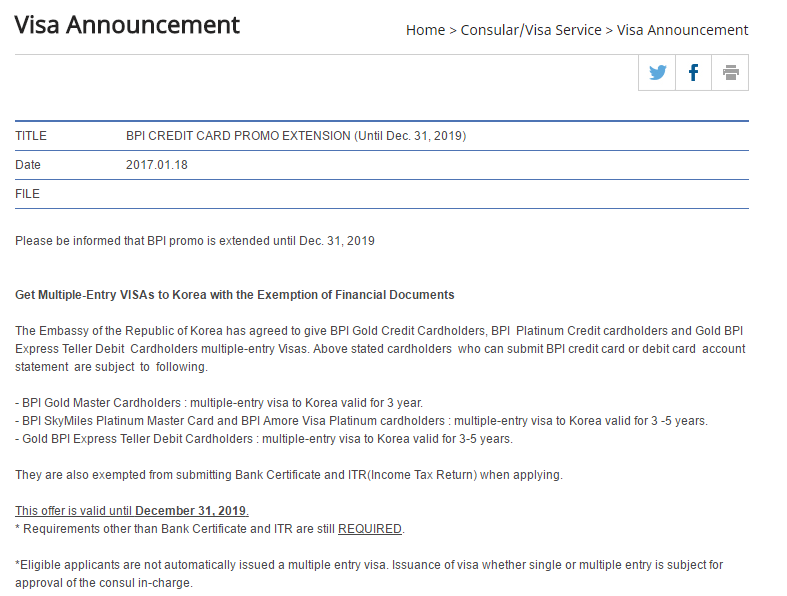 BPI credit cardholders get to enjoy the same privilege, as written in this announcement also posted on the Korean Embassy webpage. 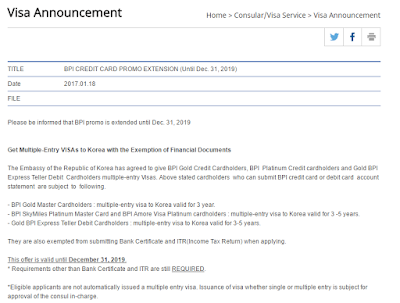 The Embassy of the Republic of Korea has agreed to give BPI Gold Credit Cardholders, BPI Platinum Credit cardholders and Gold BPI Express Teller Debit Cardholders multiple entry visas. Above stated cardholders who can submit BPI credit card or debit card account statement are subject to the following. Multiple-entry visa to Korea valid for 3 years. Multiple-entry visa to Korea valid for 3 -5 years. Multiple-entry visa to Korea valid for 3-5 years. They are also exempted from submitting Bank Certificate and ITR (Income Tax Return) when applying. This offer is valid until December 31, 2019. * Requirements other than Bank Certificate and ITR are still REQUIRED. *Eligible applicants are not automatically issued a multiple entry visa. Issuance of visa whether single or multiple entry is subject for approval of the consul in-charge." If you own any of the aforementioned cards and have been wanting to go to Korea, I suggest you grab this opportunity while the promo is still ongoing. 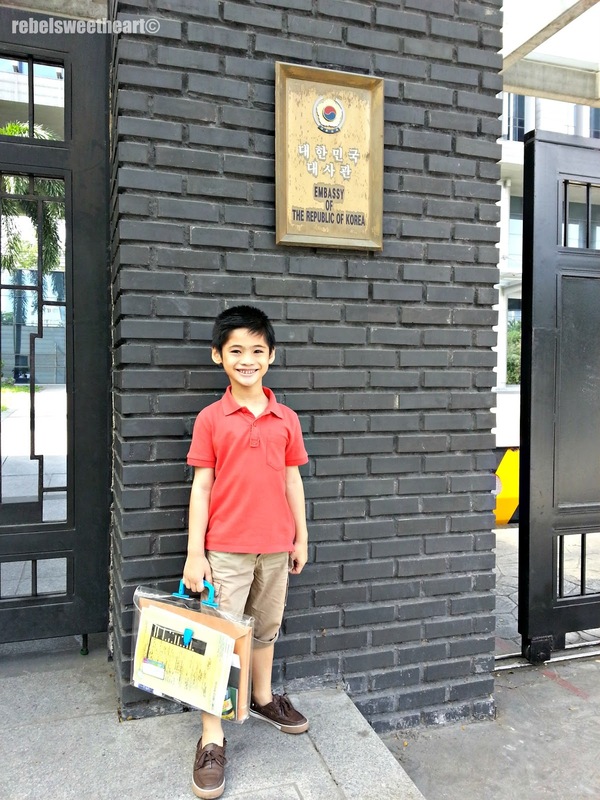 Applying for a Korean visa is actually pretty easy, as long as you can provide the necessary documents. This promo makes the application process even easier, and you even stand a chance to obtain a multiple entry visa. The complete list of requirements can be found on the Korean Embassy webpage, as well as the visa application form. Philippine passport holders who intend to visit or work in Korea are required to secure a visa at the Consular Office. Temporary Visitor's Visa may be granted a regular period of stay for 59 days, and if requested, maximum period of stay for 90 days. Transit Visa for Seafarers is granted period of stay for 59 days. For those who have Confirmation of Visa Issuance number, the period of stay will depend on the approved length of stay from the Ministry of Justice in Korea. 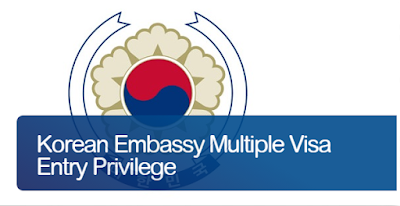 For all those who wish to apply for a Korean visa, they must comply the list of requirements. Required documents depend on the applicant’s occupation and purpose of visit to Korea. After completing the required documents, applicants may file their applications at the Consular Office from 8:30-11 am only, every Monday to Friday. Please arrive before 10:30 am to allow enough time for processing. Applicants who arrive after 10:30 am may not be accommodated. This is on a first come, first serve basis. No appointment is needed. Representative may file the applications as long as the documents are complete. Frequent travelers who have previous tourist visits within 5 years to OECD member countries, those who have at least 2 tourist visits to Korea, and seafarers who plan to transit to Korea should apply at Window 3. Those who have no previous tourists visits within 5 years to OECD member countries, and holders of confirmation of visa issuance number must present their documents at Windows 1 or 2. Processing takes 5 working days for first time travelers and 3 working days for frequent travelers. This may be extended though, depending on the Consul’s decision. Releasing time is only from 1:30-4 pm. Applicants may file their applications at the Consular Office from 8:30-11 am only. Please arrive before 10:30 am to allow time for processing. Releasing time is from 1:30-4 pm only. For family applications, documents for proof of relationship is a must. (eg. Marriage Contact, Birth Certificate) Family applications should be filed together at the same window, at the same time. Representative may file the visa applications of all family members. Visa processing takes 5 working days for first time travelers, and 3 working days for frequent travelers. There is no expedite processing. - If using Philippine Official and Diplomatic Passport. - If transiting only and going to the U.S., Canada, Australia, or New Zealand. But must not stay beyond 30 days and with confirmed onward ticket to the 3rd country. - If the individual has been to Korea for four (4) times within the past two years with a C2 or C3 visa. Or has been to Korea for more than ten (10) times already. - If Nationality is among the list of those exempted from securing a visa. P.S. Make your trip more fun and enjoyable with Trazy! Click the image for details! Congrats on your visa! Very exciting to travel to these places having the right credentials. I hope to get a visa one day, or at least renew my passport. It is great when you are able to get a reward from a credit card. I believe this could become a trend and be available in other places as well. That's pretty awesome! It's hassle free and you get to have a multiple entry visa! Thanks for the heads-up! This makes traveling convenient for cardholders! I sure hope they have the same promo for Japan. I've always wanted to go to Korea. That is really nice, I think it's great that banks are offering something like this. It makes traveling convenient for account and card holders! Thanks for letting your readers know about how to acquire a multiple entry visa to Korea. I've always wanted to go on a trip to Asia so this information will come in handy. thanks for sharing the experience and for possting tipss! this are all helpful! That’s so great you have been granted a multiple entry visa to Korea on your first application! Should definitely check out the BDO website! Oh wow it sounds like a fun experience. I'd love to get a visa to travel there for myself and my family. Congratulations on getting multiple entry visa and thanks for sharing your experience as well as ideas in getting it done. The BDO website should be so helpful for anyone trying to visit Korea anytime! Did you still pay for the multiple entry visa fee of P4k? Congrata!!! Did you still pay for the multiple entry visa fee of 4k? So that is 8k for you and your son? Hi Joan! We did not pay for anything at the Embassy. From what I know, tourist visas are gratis (free). Hi, I’d like to ask for your suggestion. I’m going to apply with my 1 year old son and my mother. Me: Housewife, has personal bank account, visited Japan and Korea once (single entry visa, within the last 5 years), has a sister who is a permanent resident in Korea. My husband who will not come along with us, is a businessman with necessary permits such as DTI, etc. Mom: Businesswoman, been to Korea twice (single entry visa, within the last 5 years), BDO gold card holder, daughter is a permanent resident in Korea. My question is what should I write regarding the funding of travel-related expenses. Can I write “myself”even if I’m a housewife? And even if I will submit my husband’s business permits? I’d rather use my bank account cause it has more transactions and movement. I also have a PENDING supplementary card application for BDO gold credit card from my mom. Or do you have any suggestions as to how to proceed? I’d appreciate your response. Thanks! Hi CSmith! Did you use your husband's proof of income when you applied for your single-entry visa? If you did, I suggest you just do the same thing, since one of the requirements is proof of employment/business. Same goes for your mom, who has been to Korea twice. As to who will fund your trip, you can write your husband's name if you will use his financial docs. Your mom should write that she will fund herself if she can show her financial docs. HI, Just a question, What is your BDO American Express Credit Card? is it Gold or Platinum or Just the Plain AMEX? Thank you.. Mine is the regular AMEX card, just like the one in the photo. Hi.. i have a question.. since you were exempted from submitting ITR, was your son exempted in submitting your ITR as well? Hello, im a principal cardholder, my wife is my supplementary, is my wife can use it also? Which standard American Express? The green one or the blue one? :) But is the bank statement really needed or not? Thank you so much for your reply. I am really sorry for asking too many questions. But may I also ask if your green card is in peso billing or dual currency? Because I called just now they said that green card is not eligible. Hi again, sorry but I have another question. When you applied using your AMEX card, did you have any OECD stamp or visa? No OECD visa on my passport then, but had stamps from my previous travels to HK and SG. Hi! With regards to the financial requirements, do i need to submit my personal bank statement along with the credit card statement? Or do i just need to submit my original credit card statement? Thanks in advance! Hello again, what if you don't have bank statements? Will they still allow? Thank u!! Hi Phoebe, you still need to show them your Bank Statement and Certificate of Employment. I would be fantastic if yoou could point mee in the direction of a good platform. site!I suppose its ok to use some off your ideas!! I am really glad to rsad this blog posts which contajns plenty of helpful information, thanks for providing such statistics.